Toasted ground hazelnuts make the cookie dough extra rich. 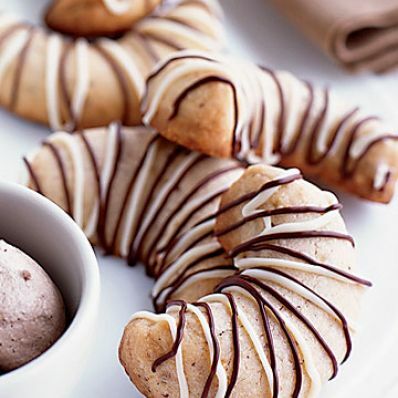 The crescents are shaped by hand and drizzled with both semisweet and white chocolate for a truly exquisite cookie. 1 of 4 In large bowl, beat butter, both sugars, 1 tablespoon water, vanilla, nutmeg and salt at low speed for 2 minutes. Scrape down bowl. Beat at medium-low until fluffy, 2 minutes. Beat in yolk, then ground hazelnuts. At lowest speed, beat in flour, just until blended. Dough should be stiff, but still soft; add a little more flour if needed. 2 of 4 Turn out onto floured surface. Divide in half. Shape each into a block, 1-inch thick. Wrap in plastic. Refrigerate 1 hour. 3 of 4 Heat oven to 350 degrees F. Break off 2 tablespoons of dough. Warm slightly with hands and roll to a 3-inch log. Curve ends to form a crescent. Space 1 inch apart on ungreased baking sheets. Repeat for a total of 48. 4 of 4 Bake at 350 degrees F for 13 to 15 minutes, until uniformly tan. Cool on wire racks. 1 of 1 Set racks over sheets of parchment or waxed paper. Place melted semisweet and white chocolates in two resealable plastic bags. Snip off a small corner of each. Drizzle over cookies; let harden. Per Serving: 27 mg sodium, 0 g fiber, 101 kcal cal., 3 g sat. fat, 15 mg chol., 6 g Fat, total, 10 g carb., 1 g pro.